The current version of this application has not yet been reviewed. Free to use. No Adverts. NHS IG Compliant. Connect faster and save lives. 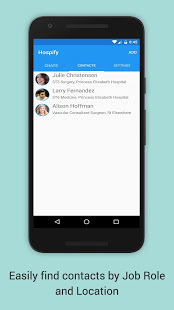 Hospify is a secure mobile messaging and contact data service for healthcare professionals & patients in the UK and EU. 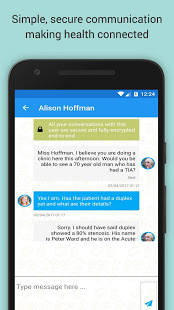 Hospify provides users with the simplicity and power of consumer messaging solutions, but unlike them ensures that all communication stays within UK & EU legislative guidelines for patient confidentiality and data protection. WHY IS IT NEEDED? 1.5m people work in the NHS; nearly 30m work in healthcare across the whole EU (that's nearly 10% of the entire workforce!). But every day they are let down by inefficient, out-dated hospital communications systems that waste their time and resources and put lives at risk, despite the fact that these days most doctors and nurses carry smartphones. WHY BOTHER? Frustrated healthcare professionals are turning to consumer messaging apps to solve the problem. But consumer solutions breach EU regulations for health data – the Information Commissioner's Office (ICO) has already fined the NHS £1.3m for data breaches, and it hasn’t even started on messaging compliance. Doing nothing is going to get very expensive... 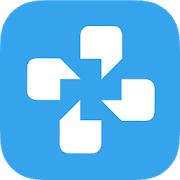 If you have any problems with the app then please report it via our website at hospify.com. Your comments and suggestions will help make the app better for everyone. The App doesn't appear to have a clear approach to dealing with user issues.